Home construction budget estimating is essential for understanding the total costs for a new home construction or home remodeling project. As a matter of fact, establishing a home construction budget estimate should be the very first item in your new home construction plans. By developing a new home construction budget estimate you can establish a financial plan that includes determining the overall cost of the project, how much to finance, and a cash flow schedule. In addition, a home construction budget helps to establish limits on the size of the new home construction project and the features in it. Establishing a home construction budget estimate not only provides a top level new home cost construction estimate, but also includes detailed cost estimates for each phase of the new home construction project. Initially the costs for each phase of the new home construction project can be swags until you actually begin to get quotes from building contractors and their subs. 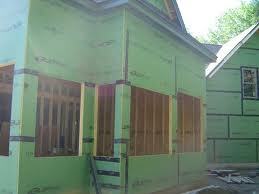 As home builder contractor bids come in you can refine your new home construction budget estimates. New home construction budget estimating also prepares you better for talking and negotiating with home builders and home remodeling contractors. By establishing a new home construction budget estimate upfront for each phase of the project, you can better assess the contractor bids coming in. By comparing your estimates with the contractor bids you can make more intelligent decisions on who to hire or what to include for specific features in your new home construction. When personally generating my own new home construction budget estimates I have found it helpful to use a tool such as Microsoft’s Excel program. Using this tool I have been able to create comprehensive home construction cost spreadsheets that contain all of the major trades required for the project, such as excavators, foundation contractors, framers, electricians, plumbers, roofers etc, and within each one of these major trade categories creating separate breakout line items for individual costs that automatically get rolled up under the major trade categories and the overall cost of the project. In addition, I also include budgeted and actual columns so that I can track my real costs to my budgeted costs throughout every phase of the project. 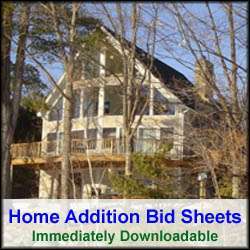 If you are interested in downloading one of my personal Microsoft Excel based Home Construction Budget Estimate Spreadsheet templates and its associated Bid Sheet, check out my Home Addition Bid Sheets and select the one that is appropriate for your new home construction project. The home construction and remodeling spreadsheets are editable and automatically role up trade categories and total home construction costs (estimates and actual). So whether your new home construction project is a new custom home, a home addition, a bathroom or kitchen remodeling project, or simply finishing an attic or basement, start off by generating a new home construction budget estimate. As you develop home construction plans and receive contractor bids you can update your home construction budget estimates accordingly. By establishing a home construction budget estimate up front, you will reduce cost overruns and in the end attain a new home construction living space that better meets your personal and financial dreams. For a comprehensive new home building checklist, see my New Home Construction Bid Sheet. The New Home Construction Bid Sheet provides a request for quote checklist section that you can provide to prospective building contractors. It also includes a comprehensive new home construction cost breakdown table, in Microsoft Excel format, that allows the contractor to include his projected new home construction costs for every phase of the project.